Tether Limited, the company that is the issuer of the dollar pegged Tether (USDT) cryptocurrency, has announced a new banking relationship with Deltec Bank and Trust Limited that is headquartered in the Commonwealth of The Bahamas. The 72 year-old financial institution has accepted Tether Limited as a client after doing the necessary due diligence review of the company. The acceptance of Tether Limited as a client of Deltec came after their due diligence review of our company. This included, notably, an analysis of our compliance processes, policies and procedures; a full background check of the shareholders, ultimate beneficiaries and officers of our company; and assessments of our ability to maintain the USD-peg at any moment and our treasury management policies. This process of due diligence, was conducted over a period of several months and garnered positive results, which led to the opening of our bank account with this institution. Deltec reviews our company on an ongoing basis. 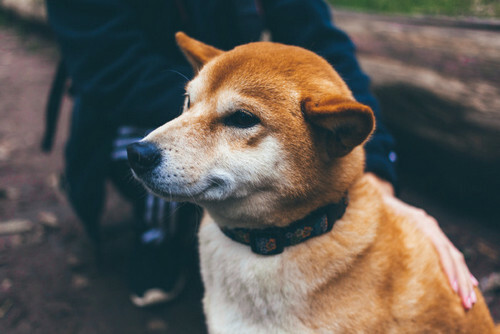 The announcement went on to reiterate that Tether limited is registered with the Financial Crimes Enforcement Network of the US Department of the Treasury. Tether limit also provided a letter from Deltec Bank and Trust Limited stating that the cash value of Tether’s account was $1,831,322,828. Comparing this figure with the circulating supply reported on coinmarketcap.com ($1,776,421,736) , we can conclude that Tether (USDT) is indeed backed by actual US Dollars. 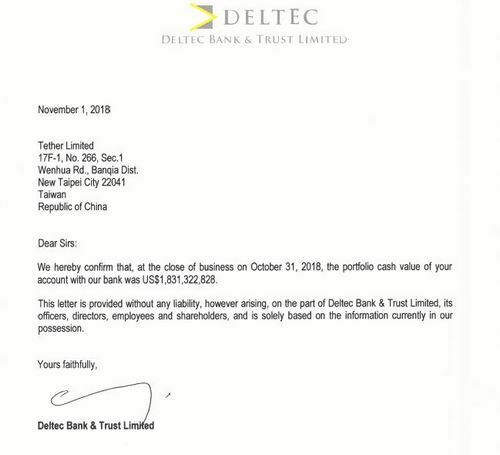 A screenshot of the letter from Deltec Bank and Trust Limited can be found below. The announcement by Tether Limited of a new account with Deltec Bank and Trust, has most likely quelled rumors that the company was on the brink of collapse after its previous banking partner – Noble Bank – was reported to being insolvent. 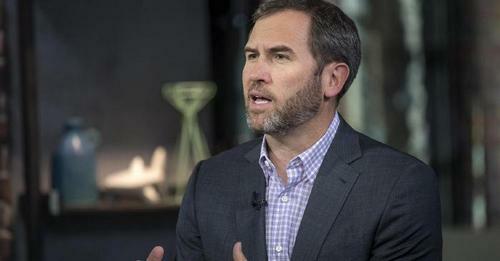 The rumors had also affected Bitfinex that has been linked to Tether on numerous occasions. With the confirmation by Deltec Bank of Tether’s account balance, traders and investors can relax a bit after watching the value of USDT fall by 4% when other rumors broke in mid October that Binance was delisting the stablecoin. The genesis of the delisting rumor, was news that Noble bank was about to collapse and would go do so with Tether’s funds. What are your thoughts on the new banking relationship of Tether Limited and Deltec Bank and Trust? Please let us know in the comment section below. Disclaimer:This article is not meant to give financial advice. Any opinion herein is purely the author’s and does not represent the opinion of Ethereum World News or any of its other writers. Please carry out your own research before investing in any of the numerous cryptocurrencies available. Thank you.